March 18, 2010 - On Wednesday, the Inspector General for the Department of Transportation, Calvin L. Scovel, testified before the Committee on Transportation and Infrastructure Subcommittee before the United States House of Representatives on the Federal Aviation Administration's (FAA) oversight of on-demand aircraft operators. Scovel, indicated on-demand aircraft operations carries a number of safety risks, such as short, frequent flights with more takeoffs and landings, the most dangerous part of flight. Unlike large commercial carriers, on-demand flights often operate at altitudes that are vulnerable to terrain and weather hazards and utilize small airports without air traffic control towers or emergency equipment. Scovel indicated the National Transportation Safety Board statistics showed that higher risks have translated into more accidents for on-demand operators. Over the last 10 years, on-demand operators have been involved in 155 fatal accidents, compared to 18 involving large commercial air carriers. Scovel further stated the FAA’s oversight of this industry is primarily based on compliance with outdated regulations that are less rigorous than those for large commercial carriers in key areas, such as flight crew training requirements and aircraft maintenance inspections. Scovel focused on three key areas in his testimony. (1) The inherent risks surrounding on-demand operators. (2) The need for an updated and effective regulatory framework given these risks. (3) Challenges facing FAA in moving from compliance-based oversight to a risk-based approach. Scovel sited that the mid-air collision between an air tour helicopter and a private aircraft over the Hudson River last August highlighted the inherent risks in on-demand operations and underscores the need for continued efforts to enhance oversight of this industry. On-demand operators fly at the request of their customers and operate aircraft that are configured for 30 or fewer passengers or 7,500 pounds of payload or less. The operators comprising the on-demand industry segment can range from a company with 1 pilot and 1 aircraft to a company with over 600 aircraft. 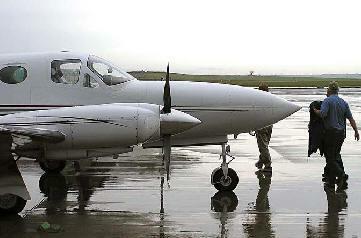 Operations include short flights to small regional airports, cross-country domestic flights, or international flights. Currently, there are more than 2,300 on-demand operators certificated by FAA across the country, compared to less than 100 large, commercial carriers. On-demand operators serve about 5,000 public airports compared to about 500 primary and commercial airports served by large carriers. These three industry segments have unique operating environments and serve very different markets. Scovel stated current regulations for on-demand operators have not kept pace with industry changes. The on-demand industry has changed significantly over the past 30 years. Today, on-demand operators commonly use jet aircraft and fly more complex operations and international flights. Scovel said despite these changes, FAA has not revised many Part 135 provisions since 1978. These regulations are also less rigorous than those for large, commercial carriers in key areas, such as flight crew requirements and maintenance inspections for aircraft (see table 1). Yet, FAA has not implemented recommendations made by its own Part 135 Aviation Rulemaking Committee or the NTSB to strengthen Part 135 regulations. Scovel indicated to the committee that the FAA lacks an oversight approach that targets areas posing the greatest risk. Instead, FAA’s inspector work programs are based on pre-determined inspections designed at the national level. As a result, on-demand operators and activities with the most risk receive fewer FAA inspections. Inspectors are also challenged by a heavy and complex workload, training and turnover issues, and inadequate data regarding on-demand operations. Additionally, Scovel stated, FAA inspections do not focus on higher risk on-demand operators and activities. On-demand operators with aircraft carrying nine or fewer passengers pose the highest risk in the industry and represent more than 85 percent of total on-demand operators. Scovel stated to the committee on-demand operators play a vital role in commercial aviation but require increased FAA scrutiny. Because the on-demand operating environment carries inherently higher risks, adjustments are needed in FAA’s regulatory and oversight approach.